Chinese officials have reported a UFO sighting while they were on an airplane and, in case anyone thought it was just a case of baijiu-induced hallucinations, they snapped pictures of it too. 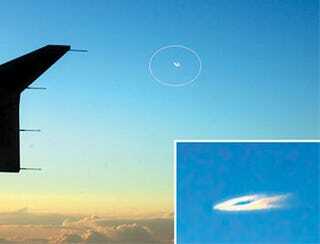 In a report from Xinhua, the government-sponsored news agency, a group of journalists and officials were on a Southern Airlines flight in late February when one of them noticed an unusual luminous object traveling alongside their vessel. After excitedly pointing it out to everyone around him, one journalist managed to snap a few photos before the object suddenly changed directions and swerved north east. The witnesses debated whether it had been a plane – but later, another plane did appear and everyone agreed that it looked nothing like the unidentified object they'd just seen.